Sometimes I must have a coconut in my kitchen, not because I’m so crazy about the taste, more because I love the whole ceremony of opening them. First I punch 3 holes into the top to pour out the coconut water (which I like a lot) and then I hammer it open. It really makes you feel like you have to work for your food, which is a rare experience in our culture. I don’t know how often I hit my thumb and swore I would never do it again, but I can’t help it, here I am again with a big hard nut on my kitchen floor, fighting for my food. As soon as the white meat is peeled out of the shell I keep it in a bowl of water as it dries out really quickly. 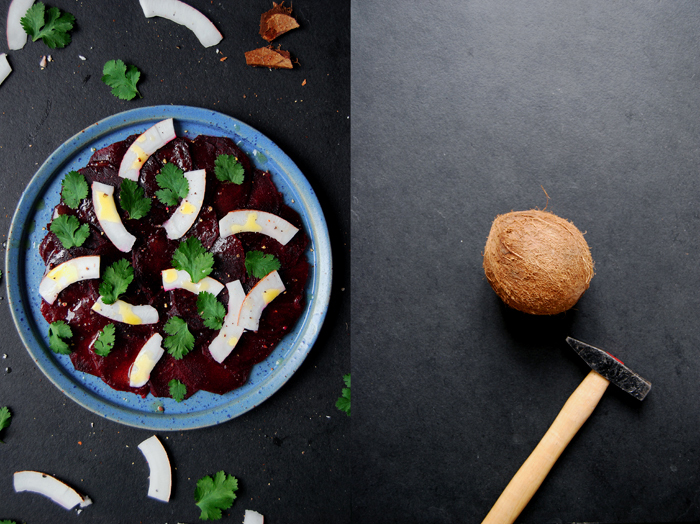 It’s quite a nice snack to nibble on but for today’s lunch I had different plans, I had a beetroot carpaccio in mind, sprinkled with crunchy coconut slices and fresh coriander. I used the coconut’s water for the dressing and whisked it with olive oil, orange juice and some of Arnold’s Maltese Orange Blossom honey (I still have a little bit left and treat it like a treasure!). 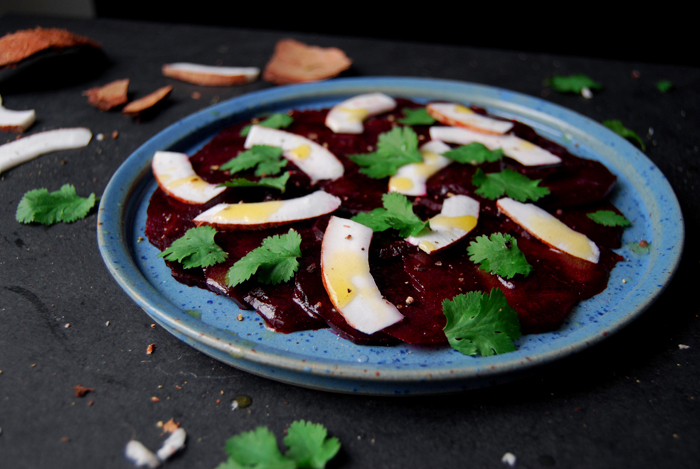 The earthy beetroot can take the combination with strong flavours and this one is quite exotic, if you’re up for something more simple, try the combination with apples and pomegranate! 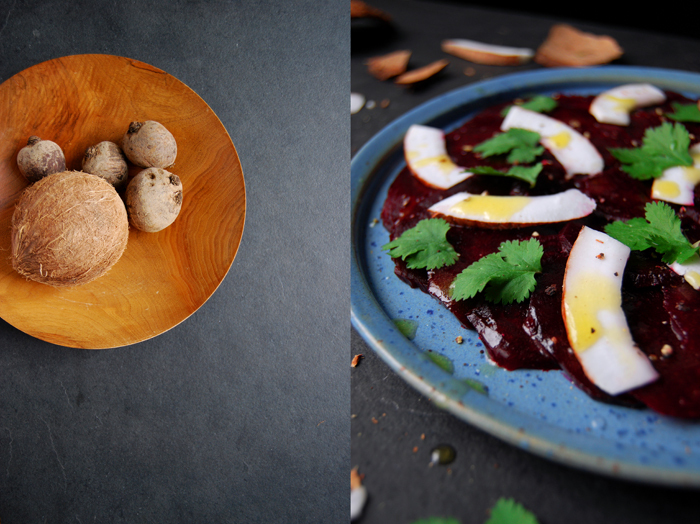 Cook the beetroots with the bay leaf in salted water for about 45 minutes, rinse with cold water and let them cool. Carefully punch (or drill) 3 holes into the top of the coconut (I use a clean screwdriver and a hammer) and pour the water into a glass, crack the hard skin of the coconut and peel out the white meat. 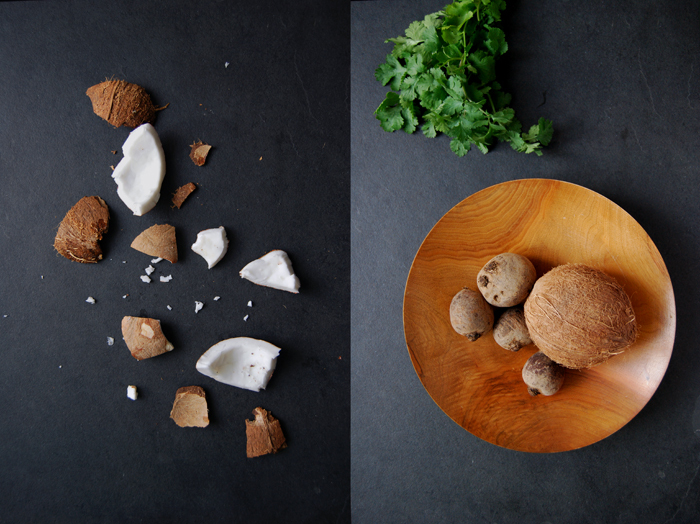 Cut about 1/4 of the coconut into very thin slices. For the dressing, whisk the coconut water, olive oil, orange juice and honey and season with salt and pepper to taste. 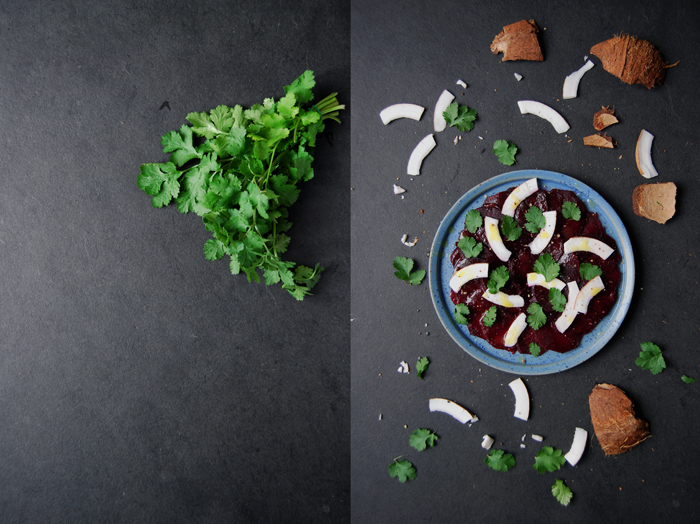 Peel the beetroots, cut them into thin round slices (with a cheese or vegetable slicer) and arrange them on plates. Sprinkle with the coconut slices, the dressing and coriander. Meike, this rather odd combination sounds rather delicious. I think I will buy a coconut this week, just so I can try it. I have the other ingredients on hand.